Do you want to add a note to the message sent? It's the first quarter of the year. From the rare solar eclipse to the forest fires that have started in Indonesia, it would be safe to say that we won't be short of environmental stories to share in the next few months. On the home front, we are gearing up to start Anugerah Hijau, our national flagship environmental program for youths. Endorsed by the Ministry of Education, Anugerah Hijau will challenge high schools this year to compete to be the greenest school in the country. So check out the official website at www.anugerhahijau.my to find out how your school can be part of it. Meanwhile, the preparations for the 9th Kuala Lumpur Eco Film Festival (KLEFF) has started and see us sealing partnerships with seven universities, and also an announcement of the line-up of judges for this year's film competition. Check out their FB Fan page at www.facebook.com/KualaLumpurEcoFilmFestival. 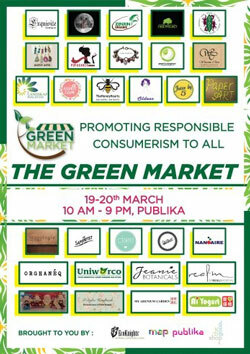 Upcoming is the Green Market which will take place over two weekends in March (Mac 19-20, Mac 26-27) at Publika Mall in conjunction with global Earth Hour celebrations. More than 50 green enterprises and NGOs will be promoting their causes and also sustainable consumption and production to the general public. Don't miss out on this! Head to the EcoKnights FB for more information. This year, EK will be focusing on supporting and enhancing Sustainable Development Goal (SDG) Number 12, which is responsible consumerism. One of the key platforms the country needs is a marketplace that promotes sustainable production and consumption. The Green Market is an event crafted to promote responsible consumerism. Come and check out more than 30 green businesses and NGOs that will be there. Support local! EcoKnights together with CIMB Foundation, Sunway Property Group and Institut Darul Ridzuan (IDR) are organizing a one day forum and panel discussion with top Malaysian leaders who advocate and practice sustainability in their businesses. Get inspired to “create shared values” for your customers, your business and your planet. 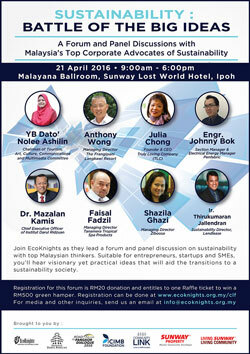 Seven corporate knights from different industries will be sharing their sustainable actions – no ideas, no blueprint. Registration is now open and limited to 100 participants only. More information about this forum can be viewed at here. 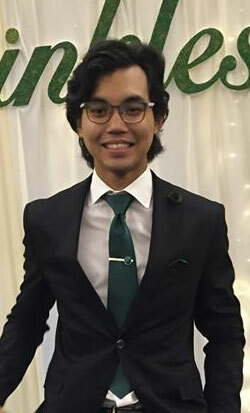 EcoKnights annually organizes a non-profit environmental film festival as a platform for Malaysians to be engaged in environmental issues through the power of audio-visual materials. Be it film, art exhibitions, performances or workshops, the Kuala Lumpur Eco Film Festival (KLEFF) is gradually gaining traction as a home grown name in environmental advocacy. 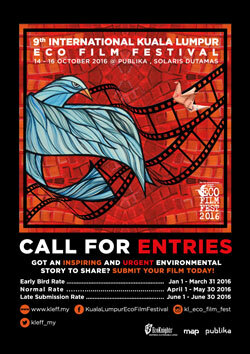 KLEFF is currently calling for films from international and local film makers. Where do I begin? As I pen this, I am sitting in the office surrounded by an environment that exceeded my expectations. My thoughts reaching out to everything in and out of the office. From our compost bins in the back, garden and cats upfront, aquaponics systems, the TV blaring as my colleague takes some time off to relax, the comfort of my chair and familiarity of my workspace, the odour of my early morning cup of coffee as I am always in the office two and a half hours earlier than I need to be (I hate traffic jams). This sense of affinity with the office has been developed throughout my two months, now running on the third and last one, here with EcoKnights. I recently finished my A-Levels programme in December 2015 and was only starting my Environmental Science degree course in September. As I was exploring volunteer programmes, part-jobs, and internships, my secondary school chemistry teacher, Puan Sheena, along with a senior I really look up to in the environmental field, Quek Yew Aun, suggested I look into EcoKnights. My ears perked up at the sound of “Eco”. When I further looked into it, I was immediately hooked. Environmental awareness and education. I could not wait! I signed up and got a call for an interview a week later. Done through Skype, I met Fadly, the programme director as he interviewed me whilst I was in college. About a week or two later, my application has been fully approved, and there was a contract and everything! I felt very professional. The office was unlike I imagined it would be. For starters, it is not exactly an office. Rather, it was a corner house in a housing area in Taman Tun, making work all the more relaxing and flexible. The office was also shared by MENGO, Poptani and CoreResources, three other NGO’s. The aquaponics systems were all set up by Poptani. The first and second days at work was a blur. Mostly because I slept through half the day on both occasions. 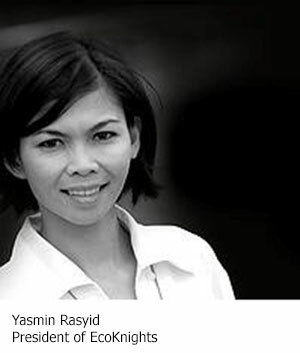 I was down with bad food poisoning, but Yasmin and Fadly were very considerate, kind, and caring and let me rest however I see fit. So I collapsed on the bean bag. Other than my unproductivity, I also met two other interns, Joycelyn and Emirul and quickly made acquaintance with them. My friend since primary school, Mandeep, was also there as he got interested in interning with EcoKnights when I told him I had signed up. Needless to say, he got through as well. Work in the office was also not what I expected. I was hoping on giving talks on behalf of EcoKnights, doing field projects and work and attending events. EcoKnights partially satisfied that but I cannot blame them. Interning at the start of the year is when everything only starts to get “set up”. I was doing a lot of office work and amongst them included mending documents, proposals, letters, sending out emails, and striking sponsorship deals with other companies alongside Fadly. Having said that, EcoKnights still managed to fulfill my initial expectations of work. On the 27th of February, I was given the opportunity to present a talk on the environment to thirty five secondary school students in a church. It was an amazing experience; finally being able to express my love for the environment to others. Other than that, we did manage to get hands-on experience on setting up our own aquaponics system (including a much bigger one we have recently installed) and I did manage to attend events for EcoKnights. I have to say, planning the events and attending them are very different experiences all together, but the former is a lot more rewarding. With that, despite EcoKnights not filling my expectations, the experience I have gained throughout the internship in mostly event management amongst other things has been an invaluable experience. Corny, I know, but true. Again, also corny by saying “corny but true” but it really is. I can imagine myself going into university as a seasoned veteran in the arts of event management. Kidding, but I do feel like I have “levelled up”. And I owe it all to EcoKnights and the other people that I have mentioned earlier, especially Quek and Puan Sheena. With that, you all have my eternal gratitude. And thank you. For everything. For more current updates on what EcoKnights is up to, do LIKE us on Facebook, Instagram and also follow our tweets. To forward this newsletter to a friend, click here. If you do not want to receive further information from us, please . You will be immediately removed from the list. EcoKnights is a non-for-profit environmental organization registered with the Registrar of Societies Malaysia. EcoKnights' core focus areas are in environmental education and awareness using innovative and creative platforms. More information about EcoKnights can be obtained from www.ecoknights.org.my. ©2014 EcoKnights Sdn Bhd. All rights reserved.